The Fear Beneath introduced the Shark Alert System in the Fall of 2008, as a response to a noticeable increase in shark activity, especially in California, Florida, and Hawaii. Northern Santa Barbara County, California – Severe Risk, up from Very High, due to Fatal Shark Attack at Surf Beach! Our Shark Alert System only provides general guidelines for safe ocean usage and in no way constitutes an endorsement of safety or a guarantee of danger. Severe – multiple shark attacks in a 24-hour period. 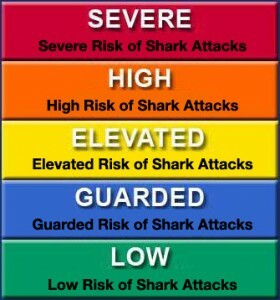 High – shark attack or aggressive shark encounter within the last 24 hours. Elevated – shark attacks or sightings from 24 hours to one week ago. Guarded – shark attack or shark sighting was one week ago to four weeks ago. Low – there have been no recent shark attacks or sightings. Please use common sense at all times.